Have a question? Take a look through our Frequently Asked Questions below. If you still can't find what you're looking for, contact us at 1-877-251-4504 and we'll be happy to help! Why Should I Insure with Riders Plus Insurance? What Happens if I Cancel My Motorcycle Policy Before the Renewal Date? What Should I Do When I Get My Motorcycle Insurance Renewal Notice? What if There Are Other M Class Licence Persons In My Household? What If I Add Accessories to – or Modify – My Motorcycle? What Kind of Motorcycle Should I Buy If I’m a New Rider? How Can I Make my Motorcycle Insurance Policy Cost Less? As a Riders Plus Insurance client, you can call us at 1-877-251-4504 to report an accident, theft, or any incident that occurs on your insured vehicle or dwelling. For an emergency claim during non-business hours you can find the emergency claim phone number for the specific insurance company we’ve placed you with right here (https://www.ridersplus.com/report-a-claim/). In many cases, when you first call in to us you won’t have all of the details required by the insurance company to handle the claim, and that’s fine. We will take whatever details you have, advise you briefly on the process and expected timelines, and direct the insurance company to start the claim. The insurance company will assign an adjuster who will contact you shortly thereafter and handle your claim until it’s resolved. You can contact Riders Plus Insurance at any time during this process with your questions or concerns and we will ensure that your issues are resolved to your satisfaction. At Riders Plus Insurance, we know why motorcycle insurance is designed the way it is, and we can explain all aspects of coverage, payment, motorcycle models, safety concerns, and anything else you need to know to get the proper insurance policy for the right price. We are the specialists. We have positive relationships with insurance companies, the motorcycle dealerships, the rider training schools, and the claims adjusters. We don’t just want to insure your motorcycle; we want to make sure that you are confident in your riding ability and your bike. We also want you to have a long, happy and safe career as a motorcycle rider. Basically, motorcycle insurance companies calculate the cost of your motorcycle insurance policy based on the time that most people ride (Spring, Summer, and Fall). They know that most people don’t ride in the Winter (you CAN, of course, you ARE covered if you have a policy), and almost all claims happen in the months that riders are actually out on the road. If the insurance companies made every month cost the same, a lot of people would cancel in the Fall and start a new policy in the Spring (and why not if you would save money?). But it would cost the insurance companies a fortune to process all those cancellations and new policies, which would increase the cost of a policy. So, since the cost of the policy comes from the losses that happen in the riding season, the insurance company essentially “adds” the Winter months on to make renewal easier and cheaper. You should never simply ignore ANY insurance renewal notice. If you don’t intend to renew your policy, always call us as soon as possible (you normally receive your renewal notice between 30 and 45 days before the renewal date) so we can advise you of your best options. For example, sometimes NOT renewing can cause you to pay more for a new policy later. Also, if you don’t call in advance, the insurance company could go into your bank account if you are on automatic payments (virtually all companies do that with motorcycle and auto policies), so you want to be sure you are making the right decisions for your circumstances. Riders Plus Insurance brokers are here to advise you correctly and ensure everything goes smoothly. And remember, now you can pay your one-time renewal payment right through our website! Always tell your insurance broker if and when anyone else in your household gets an M class licence. This is an important detail to insurance companies; they want to know who has access to your motorcycle. At Riders Plus Insurance, we can and will tell you immediately if and how the new rider could affect your motorcycle insurance policy. Simple, straightforward answers, all of your options laid out, and our advice on the best way to go forward based on your needs and wants. In most cases, a few extra pieces of chrome make no difference to either the insurability of your bike or the cost of your motorcycle insurance. Switching your exhaust, for example, should be a non-issue. However, different insurance companies have different rules and guidelines, and we even heard of a company in the past (not one that we ever represented) that would actually cancel riders who did something as simple as put a custom exhaust on their bike. 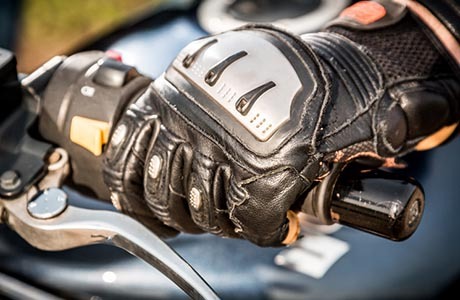 So it’s wise to always contact your motorcycle insurance broker before you make any modifications or significant accessorizing to your bike to ensure you don’t have a headache to deal with. At Riders Plus Insurance, we’ve seen pretty much every conceivable scenario, and we know the rules and guidelines of the companies we represent, so we’ll give you quick, simple answers to your questions in this area. Generally, the smaller, less expensive motorcycles cost less to insure. The trick, of course, is to find the sweet spot, the bike that has enough power to match your newly acquired skills, that is physically big or small enough for your size, and that doesn’t cost too much to insure. You also want to find a motorcycle that, hopefully, you won’t outgrow in one season. Rider Training Course instructors will be a wealth of valuable feedback for you in suggesting some models that will fit your size and skill, and so will motorcycle dealership sales people. And ultimately, your Riders Plus Insurance broker will give you specific price quotes for the motorcycles on your short list, along with specific advice on the amounts of coverage you should consider for any of those bikes. Your Riders Plus Insurance brokers know their bikes, and they will give you suggestions as well. Our most important piece of advice? Don’t buy the motorcycle until you have a firm insurance quote from a broker such as Riders Plus Insurance who will quote you accurately and knowledgeably. You can remove coverage to reduce the cost of your motorcycle insurance policy, but you always want to consult your insurance broker before you do that. For example, you could remove Collision coverage and save a little (maybe $100 or more, depending on the bike), but if your bike falls victim to a Hit and Run, or you drop it, you would have no coverage for the damage in that case. Increasing your deductibles for Collision and Comprehensive (from $500 to $1000 for example) can save you a little bit of money, but generally not very much. Your Riders Plus Insurance broker can review all of your coverage details with you and help you to customize your policy so it balances your peace of mind and your budget.